"This rod will be your doom!" The Ling Sheng Su Temple rested on a quiet mountain deep in the interior of China. The temple was considered to be the finest school for the sword and rod arts. Many great warriors throughout history have come to the temple and the monks there were still very strong. Up until ten years ago the Ling Sheng Su temple had very little communication with the outside world. One day, however, robbers raided a neighboring town and the monks opened their doors to save the village. Since that day, the great temple has accepted anyone regardless of age or gender, so long as the individual has a strong fighting spirit. Since then, it has been customary for the children of soldiers to visit the temple to hone their skills, and for farmers, merchants and others to come to the temple to learn basic techniques to protect themselves from robbers. In the main hall of the temple three sacred weapons were housed: The Kali-Yuga, the Krita-Yuga, and the Dvapara-Yuga. No one knew why they were kept there. Their story stretches far beyond recorded history and the monks follow a strict rule never to reveal the story to outsiders. On a cold winter day some time ago, a baby was found deserted in front of the Ling Sheng Su Temple. The monks searched for weeks for the child's parents, but they were never found. Having no place to take him, the monks named the baby "Kilik" and adopted him into the temple. Kilik began training with the monks in the ways of the rod from a very young age. He had a sworn elder sister named Xianglian, who had also been adopted by the temple. Xianglian studied the art of the sword, and the two had a very close bond. 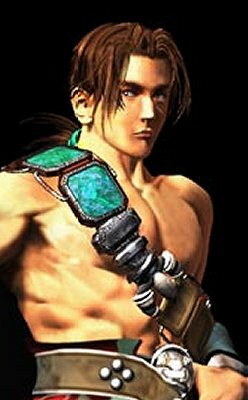 Years passed, and Kilik grew into a strong and healthy youth. His years of pratice made him one of the school's finest students, and he mastered the art of the rod taught to him by Master Han. His skill and warm personality also earned him a position as one of the school's teachers. He was such a good instructor that everyone expected him to be nominated as the successor of the Ling Sheng style rod at the succession ceremony held once every twenty years. If nominated, he would be granted the Kali-Yuga, one of the three sacred weapons of the temple. Also, his status in the temple would raise him atop the rod school as the most skilled student in the temple. Despite his success, something was bothering Kilik. He was having trouble sleeping, and so he often sat on the stone wall behind the main hall and looked up into the moon-lit sky. He had often come to this place when he was a child to lift his spirits, and it had become his favorite spot in the temple. One night, Xianglian visited Kilik as he sat on the wall, and the two began to talk. She too had been elected to be one of the successors of the treasures, the Dvapara-Yuga. This was one of the things that troubled Kilik. His sister studied the art of the sword, which meant that she should be the successor to the Krita-Yuga. He finally asked her about this, and Xianglian told Kilik something that shocked him greatly. There were only two of the three treasures currently in the temple, as the Krita-Yuga had been lost over ten years ago. The sacred weapons had been a spiritual goal for the students of the temple that the monks felt that the Krita-Yuga's abduction should be kept secret, lest it cause a moral catastrophe at the temple. Only a few high-ranking monks knew about it, and only they knew that the thief had once been a high ranking monk that had once been nominated to be the successor of the Kali-Yuga. The theif, in fact, was Xianglian's true father. She had learned of this by overhearing a conversation between the school's masters. Master Han was aware that Xianglian had heard and told her not to let the acts of her parents govern her destiny. She had come to terms with this, but still felt she was not worthy to succeed the art of the sword. If the people found out about her past, then they would not accept her. That is why she was nominated for the Dvapara-Yuga, which required the power of a pure soul and a strong mind rather than natural fighting talent. Kilik was stunned at these revalations. He remained silent for many minutes attempting to absorb all that he had learned. The two sensed an evil presence in the air, and so they hurried into the inner hall. They encountered the priests who were preparing the shrine for the next day's ceremonies. The priests had felt the evil presence as well, and gave Kilik and Xianglian the Kali-Yuga and the Dvapara-Yuga to fight the evil. The source of the evil presence had begun several hours before in Spain when a young mercenary named Siegfried had carelessly touched the evil sword Soul Edge. At that moment, Soul Edge lost it's inner balance and expelled it's evil will, scattering the Evil Seeds of disaster all over the world. Part of that evil energy reached all the way to China and fell upon the temple. It forced pure evil into the people living in the temple, driving them mad with rage as they started killing each other. Kilik too was affected, and went berserk with the Kali-Yuga in his hands. He was so strong that he defeated many people, only Xianglian with the Dvapara-Yuga (mirror) escaped the evil influence. Realizing the power of the mirror, she attempted to place it on Kilik to rid him of the evil seed, but was savagely attacked by the people of the temple. Time passed, and Kilik's senses returned. He discovered that all of the people in the temple had killed each other, including the sacred masters and the priests. He remained confused about what had caused the madness, so he tried to escape the temple. Xianglian, consumed by the evil seed by now, was the only one who barred his way. He desperately repelled her supernatural attacks, and closed his eyes and began to move without thought. A moment later, he felt something warm trailing down the Kali-Yuga and covering his hands. He opened his eyes to find the rod piercing Xianglian's heart. Although his only physical wound was a cut on his right cheeck, his mental wounds were much greater. He cried out in anguish for the death of his adopted sister. Kilik remembered little about that night. A strange figure, the enigmatic Edgemaster, entered the temple and found Kilik laying alone unconscious. Edgemaster calmly set fire to the once great temple and carried Kilik to his home. Kilik lay asleep for two days but eventually awoke in the unfamiliar house. He found his body covered in scars that had been treated, and the Dvapara-Yuga was draped over his shoulder. He turned to find Edgemaster watching over him and realized that it was he who had tended to his wounds. Edgemaster told Kilik that he was the advisor to the Ling Sheng Su arts of fighting and that he was in charge of teaching the secret arts of the Ling Sheng Su style. He then told Kilik that he could never take the Dvapara-Yuga off of his shoulder no matter what might happen. Kilik must concentrate on healing his body and nothing more. Time passed and Kilik recovered the ability to walk. Although his body was healed, his mind was still scarred. As he gazed into the sky, the memories of that fateful night returned. He could not bear the guilt of having killed the only family he'd ever known, especially his beloved Xianglian. For months he had fought desperately for the chance to live, and now the pain of living was more than he could bear. Thinking that he wanted more than anything to die, Kilik came to a sudden realization. He survived because Xianglian had placed the Dvapara-Yuga on him, the sacred mirror that had protected her from the evil seed. She gave up her life to save Kilik's and to entrust him with the mirror. Why did she do this? Edgemaster broke his long silence and provided Kilik with the answers. He told Kilik about the true source of the tragedy, the "Evil Seed." This evil had inhabited the people at the temple, and in fact possessed both Kilik and the Kali-Yuga. Only the power of the Dvapara-Yuga suppressed the evil and protected them. If Kilik removed the mirror, he and the Kali-Yuga would go berserk and turn completely evil. Therefore, Kilik and the two ancient treasures could never be seperated. Edgemaster then told Kilik the legend of the sword Soul Edge. After hearing these stories, Kilik decided to train himself under the ancient master. He trained hard to master the secret arts of the Ling Sheng Su style rod and three years passed quickly. He learned to control himself and the Kali-Yuga to stop the evil possession. However, there was one final task he had to perform before he could truly complete his training. Edgemaster ordered him to journey to the west to purify himself. Kilik left Edgemaster's home to begin his journey. Kilik traveled to the West, where he heard the Soul Edge had been sighted. He journeyed to an Indian port town to book passage on a ship headed for the West. He approached the first mate of a pirate ship that agreed to take him on as a passenger. Kilik was just beginning to pack his belongings onto the ship when it was attacked by demonic forces led by Astaroth. Kilik fought alongside the pirates to defend the ship, but one by one the crew was massacred. The captain of the ship, Maxi, returned from the market to join the fray, and together they drove the monsters back. However, every single member of Maxi's crew had been killed. Honoring his first mate's dying request, Maxi agreed to take Kilik to the west to find the Soul Edge. On the way, Kilik picked up another traveler, the Chinese warrior Xianghua, who was also seeking the Soul Edge. Kilik allowed her to travel with him, not knowing that she possessed the Krita-Yuga, the third of the Lin Sheng Su temple's sacred weapons. The trio finally arrived at Ostrinesburg castle in Germany, where they encountered the evil creature Nightmare. The creature indeed possessed the Soul Edge, and at once attacked the three warriors. It was then that Xianghua's weapon began to glow. Finally realizing the power they possessed, the three attacked Nightmare with great tenacity until the evil knight fell. Nightmare lost his grip on the Soul Edge, and transformed back into Siegfried, the boy he once was. However, the threat was not over. From Soul Edge, the monster Inferno came, with the power of all the souls it had accumulated over the years. The three attacked Inferno, but found it a difficult task to beat him. Maxi was severely injured during the fight, and later died. Kilik and Xianghua, however, were protected by the sacred weapons, and soon emerged victorious. The Soul Edge was destroyed, and Inferno was dispersed. Mourning the loss of their brave friend, Kilik and Xianghua left Ostrinesburg castle and returned home. Kilik returned to Edgemaster, who was proud that his pupil had completed his final test. Kilik continued to train, for he knew if he ever lost his control he would be consumed by the evil within him.